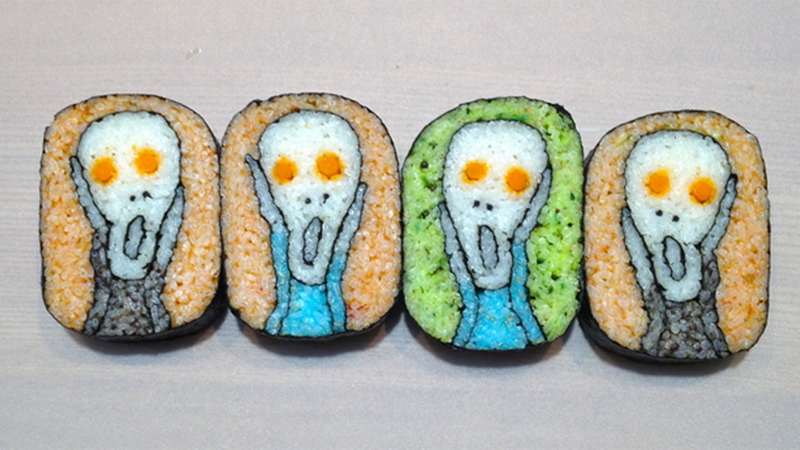 Sushi rolls that look like great works of art. Or video game characters. Or dookie or dicks. Meet Takayo Kiyota, a makizushi ("rolled sushi") artist. Makizushi is sushi wrapped in rice and seaweed. The cylindrical roll is cut, revealing the roll's contents. It's not easy to make good makizushi, let alone makizushi that looks like naked men. Kiyota layers colored rice to "paint" with sushi so to speak. But as website Spoon & Tamago points out, she must imagine how the cross-section will look when she cuts the sushi roll. Her rolled works are cute, playful, and even profound. Here's a single sushi roll that shows an embryo. Cutting the roll in different places reveals different stages of the embryo's development. "I never know what the inside looks like so I'm never sure if it will come out the way I imagined. And I can't make edits once it's done," writes Tama-chan (via S&T). "Facial expressions are especially difficult because small ingredients or overly exerted force when wrapping can completely throw things off. It's always a special moment when I make the first incision to reveal the image."